A classic effect with an LED Twist! The Accu UFO Pro, a member of the acclaimed American DJ Accu Series Intellignet Lighting Effects, is an unique moving head effect that features 32, 1-Watt red, green, blue and white bright razor sharp LED beams that twist, turn, strobe and pulse. 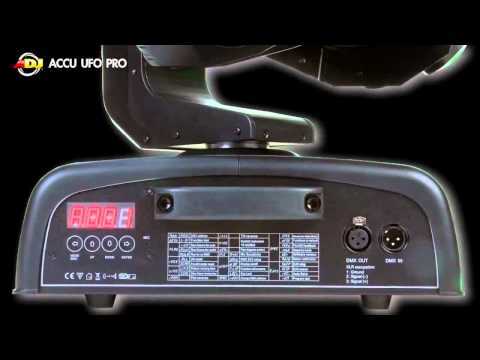 The Accu UFO Pro will run using a DMX controller or let it move to the sound of music with it’s exciting built-in programs. The unit has two different DMX Channel Modes (8 or 10), and offers smooth microstepping from it 1.8 degree Stepper Motors with 8-bit or 16-bit movement. Utilizing LED technology, the Accu UFO Pro requires very little power to operate (only 100W max) , can run all night long with no duty cycle and requires low maintenance with it’s LEDs rated at 50,000 hours. Considering purchasing the American DJ Accu UFO Pro 32 LED DMX Moving Head? Have questions? Ask people who've recently bought one. Do you own the American DJ Accu UFO Pro 32 LED DMX Moving Head? Why not write a review based on your experience with it. A good powerful light but does need improving. This is an excellent light and is very good when using in a dance show as the range of colour. The only thing I would improve is that its wired and this does limit the potential. 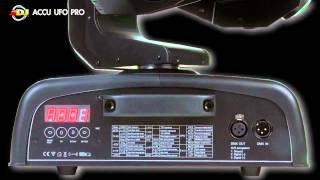 Seen a video for American DJ Accu UFO Pro 32 LED DMX Moving Head online or have you own video? You will earn 1,378 loyalty points with this product worth £3.45, when logged in. Check out American DJ Accu UFO Pro 32 LED DMX Moving Head on DJkit.com!